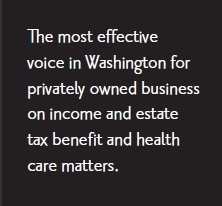 Has been representing Small Businesses in Washington for over 30 years. About one-third of SBCA members are advisors for family and privately owned businesses – lawyers, accountants, actuaries, financial planners, insurance advisors and plan administrators. Our Advisory Boards are made up of the leading small business experts in the country. We are proud to have the leaders of national and state bar, CPA, pension and actuarial and insurance associations and state and local estate planning councils as our members. The faculty for the major tax, employee benefits and health care conferences in the country almost always include SBCA Board or Advisory Board members. This expertise allows us to understand, analyze and track tax legislation that affects small businesses. Because of our expertise, we are not “conned” by the misleading summaries of tax bills which stress how changes are for simplification, equity or reform. Perhaps our most important function is being able to change tax legislation before it becomes law to ensure that small business is protected. The SBCA is constantly working to simplify the federal tax and employee benefit laws and regulations. 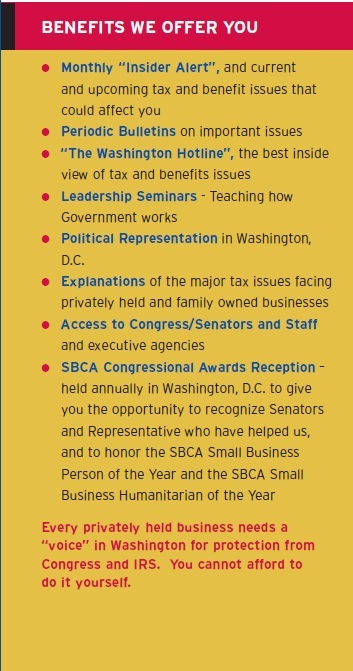 Most SBCA members are businesses whose owners know that tax and benefit issues are critical to their success and security. These members want to know what’s going on in Washington that could affect their business and they want to have a voice in Washington. We’ve been told more than once by prominent staff members on the Hill that our grass roots efforts are nothing short of astounding. The SBCA knows how important it is for a small business to be able to sponsor a retirement plan which provides adequate retirement benefits for its owners and employees. The SBCA works to increase the benefits that retirement plans can provide while simplifying the rules governing them. The SBCA is proud of our role in the content and passage of the tax law known as EGTRRA and our role in making those laws permanent. The SBCA is working to promote positive changes in the law and to prevent erosion in the tax incentives so important to the health of the small business retirement system. The SBCA is a leader in trying to bring certainty to the estate tax area so that the owners of small businesses can plan for the future. Our goal is to increase the exemption level while achieving a tax rate reduction. The SBCA is committed to keeping the step up basis in the law and to rejoining the gift and estate tax systems. The SBCA is also working to create an estate tax exemption for up to a million dollars of retirement plan money in order to encourage people to save for their retirement. The SBCA is working to come up with a fix to the alternative minimum tax problem. The SBCA wants to repeal all of the rules in the Internal Revenue Tax Code which discriminate against 5% owners (aka the owners of small businesses). The SBCA is working to end the discriminatory tax treatment of personal service organizations. The SBCA is committed to seeing a SIMPLE cafeteria plan enacted into law which will bring cafeteria plans to small business. The SBCA is working to have 409A not apply to private business. 409A stands for everything the SBCA is against. This relatively short Tax Code section was enacted to prevent top executives from bailing out with millions of dollars from non-qualified plans as the big businesses they worked for collapsed. 400 pages later, IRS regulations now define non-qualified deferred compensation plans to literally include almost every small business operational agreement. Absent being exempted from the reach of this onerous Tax Code section, small business will waste countless dollars changing employment agreements, operating agreements, buy sell agreements, etc. so that they comply with a section in an area where there is no abuse. If Congress wants to simplify the Tax Code, this is the first place to look. The SBCA believes the Tax Code can and should be simplified. Because of the expertise in our Board and Advisory Boards, we work at a very technical level to accomplish real simplification. The SBCA wants to maintain a private system of health care with freedom to choose doctors and treatment. We know that it is critical to have access to quality health care. We know that small businesses are picking up the additional health care costs due to cost shifting by the government through Medicare, the better bargaining position of big business and by the costs incurred by the insured for care of the uninsured. The SBCA is working to come up with a workable reform of the health care system. Ultimately, the goal of the SBCA is to keep small business a vital segment of our economy and to keep our members successful and strong.